Michael White kept up his bid to win back-to-back titles by beating Mark Williams 4-2 in the semi-finals of the Indian Open. In tonight’s final, world number 22 White will face number eight Ricky Walden, who came from 3-0 down in the second semi to beat Thepchaiya Un-Nooh 4-3. The winner of tonight’s best of nine frame contest will collect £50,000. and the runner-up £25,000. Talented 23-year-old White won his first professional title at the Shoot-Out in Blackpool last week, and now 4,500 miles away in Mumbai he has the chance to capture his first world ranking title. In fact the Neath cueman had never previously been beyond the quarter-finals of a ranking event, but showed few signs of nerves in a superb display against fellow Welshman Williams, his boyhood idol. Two-time World Champion Williams won a scrappy opening frame on the colours before White hit his stride with an excellent break of 126 to level at 1-1. He also got the better of the next two frames to lead 3-1. Williams won a safety battle on the last red in frame five and took advantage to close to 3-2. 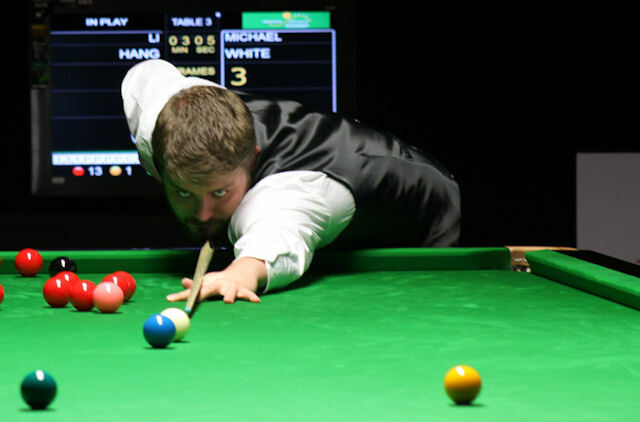 But White finished in style as a series of cracking pots helped him compile a run of 87 in the sixth. “In the last frame I felt as if I wasn’t going to miss,” said White. “I knew it was my chance, and I felt composed and calm. The first frame was very scrappy, but then I had a century to settle me down, and after that I felt as if I controlled the match. Mark and I are good friends and last night I tweeted him to say I was coming to get him. If I had lost I would have wanted him to go on and win it, but luckily it’s me in the final. Walden is within one win of his fourth ranking title, and first outside China. He won the 2008 Shanghai Masters and 2012 Wuxi Classic before victory at the International Championship in Chengdu earlier this season. The 32-year-old from Chester has never lost a ranking final. Thailand’s Un-Nooh has been this week’s giant-killer, knocking out the likes of Ding Junhui and Mark Davis. The world number 61 had never previously been beyond the last 16 of a ranking event, but looked set for the final when he took the first three frames today with breaks of 78, 62 and 68. Walden got going with a run of 81 in frame four, then got the better of a scrappy fifth frame before making a 78 for 3-3. The Englishman had a clear match-winning chance in the decider but played a poor positional shot on 41 and had to play safe. Un-Nooh responded with 34 and the frame came down to the last red. Walden, trailing 42-47, laid a snooker and gained 26 points in fouls as his opponent missed the red six times. Walden later executed a fine pot with on red, with the rest to a top corner, and cleared to the pink for victory.